Group merging is the process of taking one or more categories and giving them the same name for the purposes of results analysis. This process is sometimes called 'category standardization'. 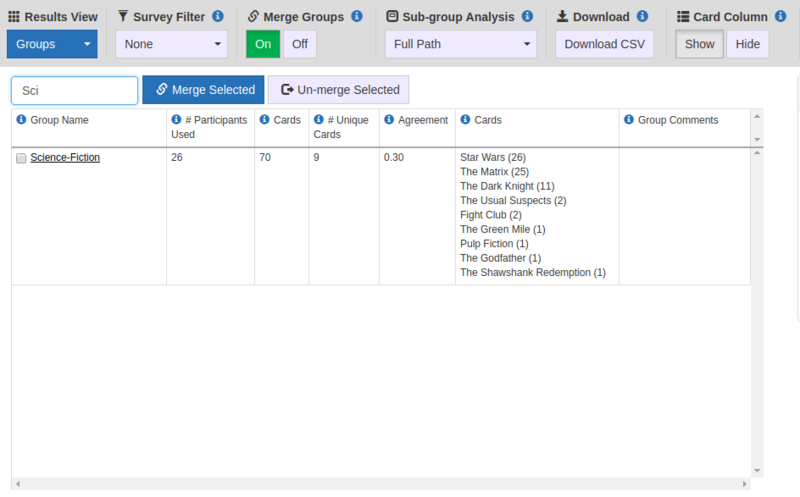 Group merging is done through the Groups table and is only available for Open or Hybrid card sorts. All results tables have a toggle to turn on and off the use of the merge in the results that they display. Select 2 or more of the check boxes in the first column of the groups to merge. Click the 'Merge Selected' button above the table. Provide a name for those groups to be assigned. Click Merge. Those groups are now merged. 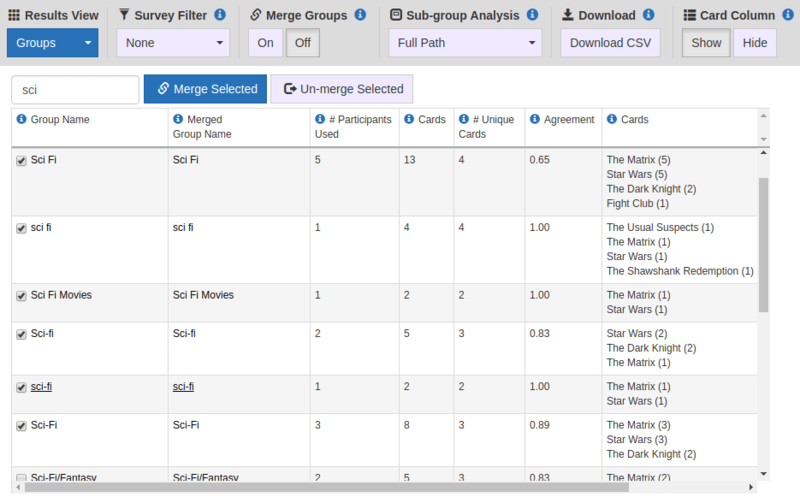 Use the Merge Group toggle at the top to view the consolidated results. The groups table with the groups that should be merged checked off. Note the use of the group filter to find similar group names. The groups table after the groups have been merged. The merged group name is listed in the 2nd column. Underline indicating it is a merge group name. Note: the 'Merge Groups' display is still turned off, so the groups are still listed separately. 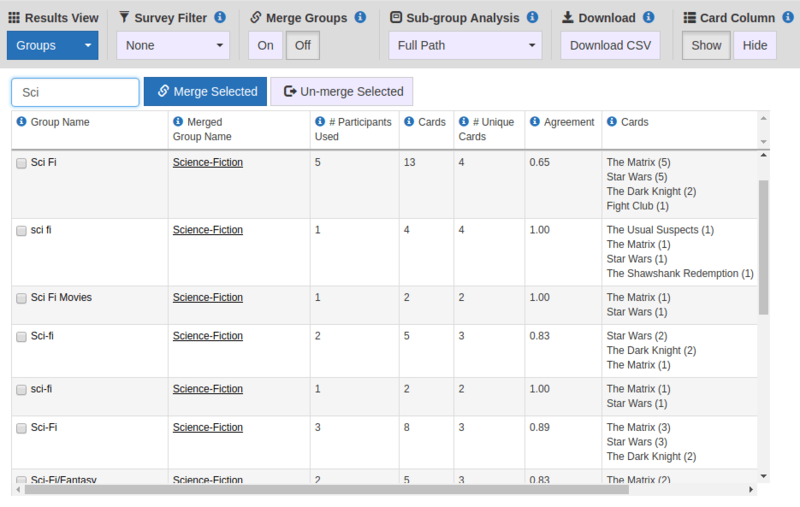 The groups table with the 'Merge Groups' turned on - showing the consolidated results using the merged group. Select the check boxes in the first column of the groups to un-merge. Click the 'Un-Merge Selected' button above the table. Scan the list of group names to find common names with small differences in their wording. After completing a number of merges, try using the 'merged' view of the groups table to find remaining outliers - as it reduces the number of groups to view. Remember that groups are case-sensitive, so 'Science Fiction' will be listed separate from 'science fiction'. We do this to maintain specific Casing that may be important to the user such as acronyms.